Join us at WantedDesign from May 17-20, where Products of Design students will present ALSO!, a series of interactions that explore how we experience new design. The event is free. Located at 269 11th Avenue, New York City, WantedDesign is a creative destination for the design community that offers innovative installations, student workshops, and engaging discourse. Through a roving set of mobile interventions—both cart-based and human-worn—visitors to the show participate in an unfolding narrative around celebration, sustainability, digital mediation, storytelling, and scale, each expanding the conversation around design beyond form, function, and materiality. 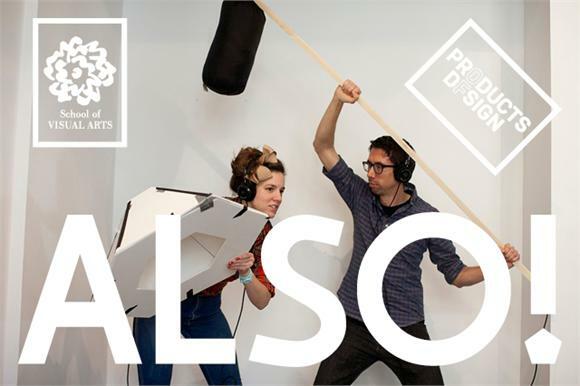 Experience previews at www.alsoproject.com, and follow ALSO! on Facebook and Twitter. This year, WantedDesign is being held in concert with NYCxDESIGN, New York City's inaugural citywide event to showcase and promote design of all disciplines. A smartphone kaleidoscope and lift apparatus expose the distortion of constantly consuming experiences through our screens; a set of ViewMasters lets us peer into speculations around the unseen, “un”wanted, and marginalized; a sound crew with microphones and headphones invites visitors to listen in on the untold stories of objects; a digital microscope on a remote cable reveals hidden design details invisible to the naked eye; and a die-cutting station prompts guests to transform their printed materials, ennobling ephemera and inviting visitors to reflect their experiences to one another. Through this series of moving, participatory installations, the work hacks the exhibition at large, prompting visitors to see design through a variety of new lenses.